Have a need for remote power and/or communications? Open Range Access’ GreenSpeed Communications and Power Trailers have got you covered. All trailer applications can be manufactured as skid-based for the same price. Temporary power for construction offices, well pads, or other temporary structures. With our inverter option the power trailer can be used to charge personal electronics and power tools. Starting Price for the GreenSpeed Communication Trailer is $6995. Cell Modems/IP Radios/Satellite uplink available depending on your needs. Climate controlled 19 inch equipment rack for data and voice communication providing support for a wide range of data and voice communication equipment. Provides an alternative to gas powered generators for rental facilities that have customers concerned about green energy. No worrying about whether or not you have enough fuel for your generator. Disaster recovery, search and rescue, and wild land firefighting involving working in remote rugged locations where radio communications is hampered by the terrain. Placing our remote communications trailer in the search location improves communications with your search team. Oil, gas, and water applications always struggle with remote communications and the current alternatives are expensive. We have proven experience in this environment, so let us help. This is a great solution for wireless ISPs. Our Communications Trailers include everything you need to quickly add new customers without the cost of adding a new tower. 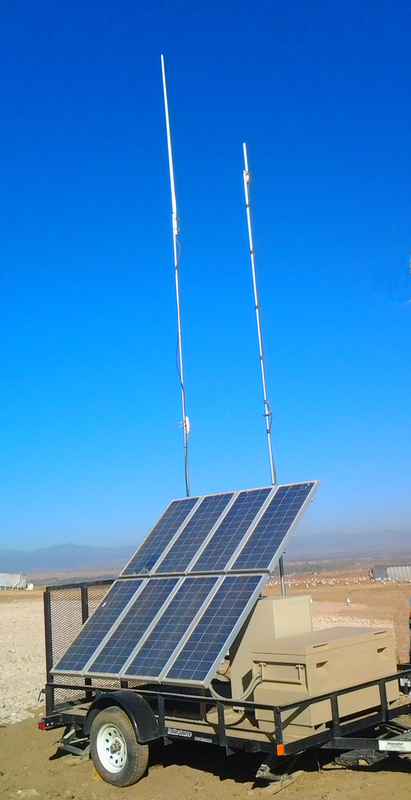 Plus by limiting the tower height to 35 feet on a mobile tower, you don’t need to worry about additional FCC licensing. Homeowners living in remote areas would benefit by using our Communication Trailers to boost unreliable cell signals. Construction and landfill sites benefit from the Communication Trailers because of the mobility of the solution. So as the structure or the terrain changes, the communications can remain uninterrupted as the trailer is moved. Starting Price for the GreenSpeed Communications Trailer is $9995. Leveling jacks in four corners of the trailer allow for stable placement in rugged environments. Smaller trailers can be pulled by ATV. All our trailers have high axels to allow clearance on rough roads. Reach out to our supply manager at 303-952-4090/866-847-7508/sales@openrangeaccess.com to see how we can help you.